The Bernese Mountain Dog is one of the four ancient Swiss Sennenhunds, developed when the invading Romans bred their mastiffs to local flock-guarding dogs, and is the only one with a full coat. 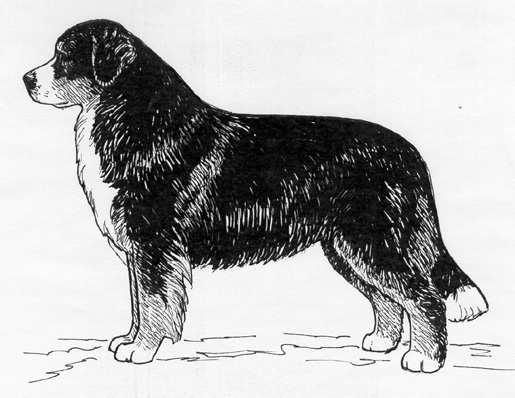 Refined in the Berne region, dogs of this breed were routinely used for multiple jobs. These included: general farm worker; flock guardian; and draft dog. The breed is characterized by the classic, striking Sennenhund tri-coloring (black ground color, with rust and white markings). The Bernese Mountain Dog was recognized by the United Kennel Club in 1948. The Bernese Mountain Dog is large, sturdy, balanced and agile, reflecting its historical origin and uses. They are slightly longer than tall, though sometimes appearing square. Their substantial and sturdy bone is characteristic of the breed. Males denote a masculine appearance and females are distinctly feminine. The Bernese Mountain Dog is shown in a natural appearance; unnecessary trimming is not desirable. The breed is self-confident, alert and vigilant. They are good natured and reliable with their families and self assured and accepting with strangers. The head is strong but not too massive, in balance with the size of the dog. The skull is broad and slightly rounded. It has a slight furrow leading to a well-defined, but not exaggerated, stop. The muzzle is straight and strong. The breed is dry-mouthed, having clean lips that are black in color and only slightly developed flews. A full complement of strong, white teeth meet in a scissors bite. A level bite is acceptable. Eyes are dark brown in color, and almond in shape. The expression is gentle and intelligent. Eyelids are close-fitting. Fault: Light or round eyes. Disqualifications: Wall eyes. Entropian or ectropian. The ears are triangular in shape and of medium size, gently rounded at the tip. The top of the ear is level with the top of the skull. They are set high, and hang close to the head when at rest. When the dog is alert, the ears are raised at the base and brought forward, with the front edge remaining close to the cheek. The medium length neck is strong, muscular and well set on. The flat-lying, well-muscled, tight shoulders are well laid back, forming a good angle with the upper arm. The forelegs are straight and strong. The elbows are close to the chest. The pasterns slope very slightly. Dewclaws may be removed. The topline is level from the withers to the croup. The chest is broad, with well-sprung, deep ribs which reach to the elbows and a well developed forechest. The back is broad and firm. The loin is strong. The croup is broad and smoothly rounded. Faults: Overly long or thin body. The upper and lower thighs are broad, strong and muscular. Stifles are distinctly bent. The hock joint is well angulated. The rear pasterns are straight when viewed from the rear. Rear dewclaws should be removed. The feet are compact and round, with well-arched toes. Fault: Feet which turn in or out. The bushy tail is carried low when in repose; an upward swirl is allowed when the dog is alert or moving, but the tail is never curled over the back. The tail bones are straight and reach to or below the hock joints. Severe Fault: Tail carried over the back. Disqualifications: Kink tail Ring tail. The thick, single coat has a bright, natural sheen. It may be slightly wavy or straight. Severe Faults: Extremely curly or extremely dull coats. The tri-colored coat is a breed characteristic. The ground color is always jet black. Markings are rich rust and clear white in color. Symmetry of markings is desirable. This includes: rust over each eye, on the cheeks reaching to at least the corners of the mouth, on each side of the chest, on all four legs and under the tail. White markings include a blaze and muzzle band, as well as an inverted cross on the chest and a white tail tip. White on the feet is desirable, but does not extend higher past the pastern area. Faults: Any deviation from the desired markings are faulted in relation to the extent of their deviation. Disqualification: Albinism. Any ground color other than black. Any color combination other than tri-color. Males: 25 to 27½ inches. Females: 23 to 26 inches. The natural, normal gait is a slow trot, but the dogs are capable of speed and agility. The dogs exhibit good reach and powerful drive, without any wasted action. As speed increases, the dogs tend to single track. Any color combination other than tri-color.